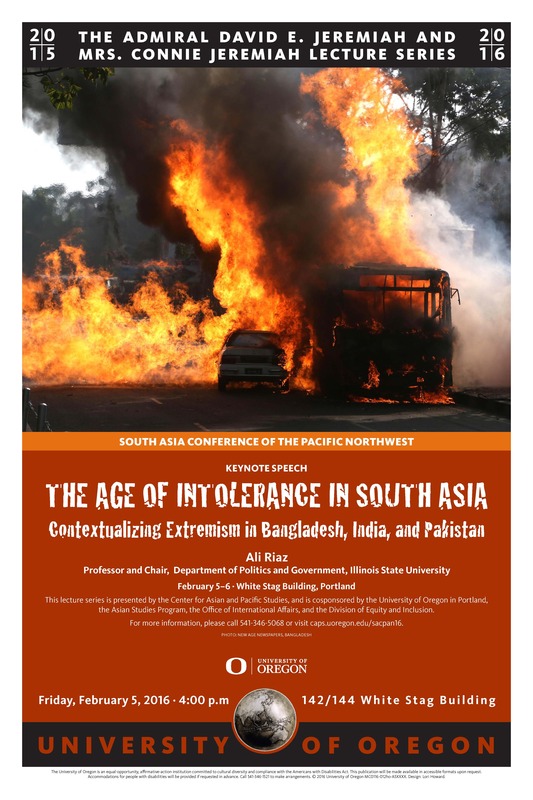 The University of Oregon will host the South Asia Conference of the Pacific Northwest (SACPAN) on February 5-6, 2016 at the UO White Stag Building in Portland, Oregon. Following on the successes of previous SACPAN meetings, we invite faculty and graduate students from UW, UBC, UO, Portland State University, Oregon State University, Reed College, Lewis and Clark and area institutions to informally outline on-going, evolving, and new research on South Asia and its diasporas. We have two types of presentation formats; individual presenters and organized panels. Each presenter will get 15 minutes to present their research. Organized panels will be in a roundtable format that leaves more time for discussion of critical issues. The University of Oregon White Stag Building is located at 70 NW Couch Street in the Old Town Chinatown Historic District. The entire conference will take place in this building. Check-in will begin at 3:30pm outside of room 142/144. This event is cosponsored by the University of Oregon, the University of Washington, and the University of British Columbia. For more information, please call Jonathon Campbell at 541-346-5068 or jwcamp@uoregon.edu.